I had a great class yesterday, although I didn’t hit my max Clean and Jerk lift and I dropped the bar a few times. 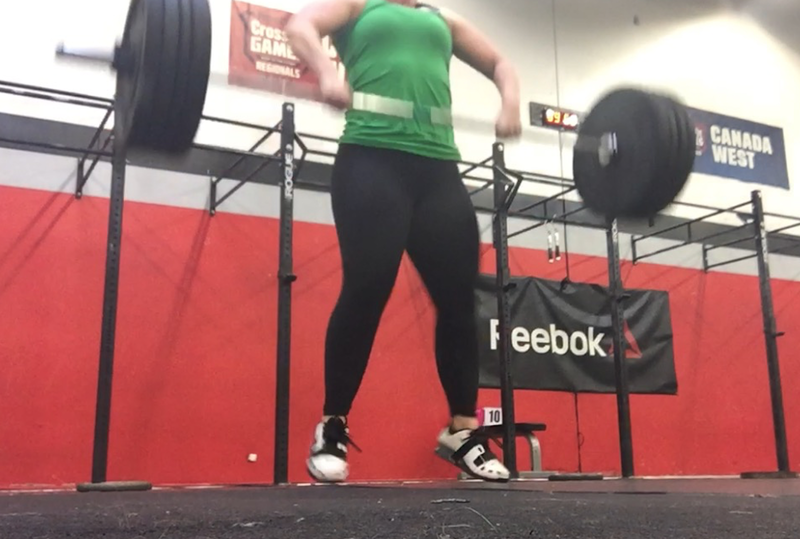 I was having issues committing to catching the bar after a while and I chalked it up to feeling fatigued, so I lowered my weight and worked at that weight for the remainder of the class. This was how I dropped the bar several times, and after that I started dropping the bar before getting into the squat. One of my favourite athletes that I follow on Youtube and Instagram is Megsquats – a power lifter that has been based out of New York but recently moved to Vancouver (yay!). Although she’s a powerlifter and in a different sport (and league) than I’m in, she dabbles in Olympic Lifting and more importantly, I really admire her attitude about body and women in strength sports. She very recently addressed an issue that is so common in this fitness focused online community and that is body critique and heckling. She’s received critique about the way her lower abdomen looks when doing heavy lifts – commonly referred to as FUPA (fat upper pubic area). As you can see from my lifting videos, you have to come to terms with the fact that you will have an unpleasant appearance to your abdominal area during lifts due to the breathing technique (bracing your core), and you will have double chin from the way you have to move your head, or you may wear knee sleeves that your legs bulge around, or you may wear a weight belt that gives you muffin top. This sport is not about your vanity. I love how she addressed the issue in her video and on her instagram post and I wanted to share it here, since we are a very fitness focused community. 290lbs for 13. Some (not most, but some) people will watch this video and think, “look at her FUPA” and you know what, me 5 years ago would, without a doubt, think and comment that as well. I currently live my life where my priority is always strength, and I care more about how I act, what I accomplish, and the relationships I have over how I look. I also value people for what they’ve done, or what they’re doing. I remember being so insecure that I’d size up every woman I met based on how she looked. Proud that I’ve turned into the type of woman who’s just tryna figure out how you got so strong (not just physically). Cheers to growth. Cheers to FUPAs. Cheers to seeing what’s important. "Store Photos｜Ooh La Lace Wunder Under Pants, Mini Dedication Dot Speed Shorts, Cardio Squad Tank, Gear Up Long Sleeve, Gear Up Bra, Gear Up Crops"
Ok… I feel the need to comment (constructively!!). This is the same way I felt when I saw the video about crossfit and for women that you weren't training hard enough if you weren't "leaking" urine. I am all for women and strengthening SAFELY. Look at the strain in the pelvic floor, what are you guys calling it these days ?"Fupa"? After reviewing the video of that strong lady, she has some issues with her form. Look at the pelvic floor push out with the lift. Ask yourself not whether that looks attractive or not, but ask yourself "is this good for my body?" Look at her back round out as she fatigues. Ask yourself "is lifting this weight worth injury to my back?" Let's get serious, being strong is great, but as the quote goes "train smarter, not harder." Again, to the pelvic floor issue and watch her face. Look at the strain in her neck and head. That's the valsalva manoeuvre, that increases pressure in your head. Should we be unnecessarily be putting that much strain on blood vessels in our heads (FYI this is how older adults sadly pass away on the toilet)? Please, please, please train safely and smartly ladies!!! If you're pelvic floor is doing that please go see a specialist. There are pelvic floor physios who specialize in fixing these issues. Don't be afraid to ask questions! If something doesn't feel right, it probably isn't! Sorry, just want everyone training to be their best, but be safe and smart! Happy training to all! There's always one. Meg's form is fine. She is a competitive powerlifter. And yes, she's using the valsalva maneuver because she's supposed to, that's why she's wearing a belt. I love all of Megsquats' content! Wow so strong! But I admit I questioned her form too.